Revani; deliciously moist semolina sponge cake in syrup; this lighter version is still packed with a lot of flavor. 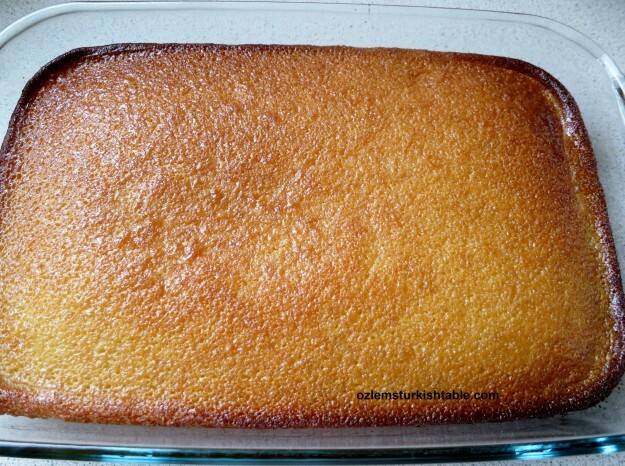 My 9 year old son asked if we may bake anneanne’s (grandma’s) Revani semolina cake the other day and our heart was set. We don’t enjoy overly sweet desserts and this delicious, moist semolina sponge cake in lighter syrup has been a favorite with us. We love semolina’s grainy, nutty texture, the goodness from yoghurt and the refreshing lemony flavor in revani. I also used mild olive oil here and worked really well; lighter but still packed with a lot of flavor. Revani has been a popular dessert with us Turks since the Ottoman Period; it is believed that the name Revani is given when the Ottomans conquered the city of Yerevan in today’s Armenia. Revani has many versions and been enjoyed in various cuisines especially in the Eastern Mediterranean countries, as well as in Turkey. I have seen the addition of rose water, orange flower water and orange zest to revani, all sounds delicious. Make sure to prepare the syrup ahead of time and that it is completely cool before pouring over the semolina cake, otherwise the cake gets soggy. Traditionally it is baked in a baking dish but my 6 year old daughter also wanted to make a few Revani cupcakes and they turned up rather wonderful! :) If you would like to bake revani as cupcakes, make sure to grease each cupcake shell with olive oil and not to overfill. If you are using paper cupcake shells, I suggest you to have 2 paper shells stacked together to provide a firm base, so that the batter won’t spill. 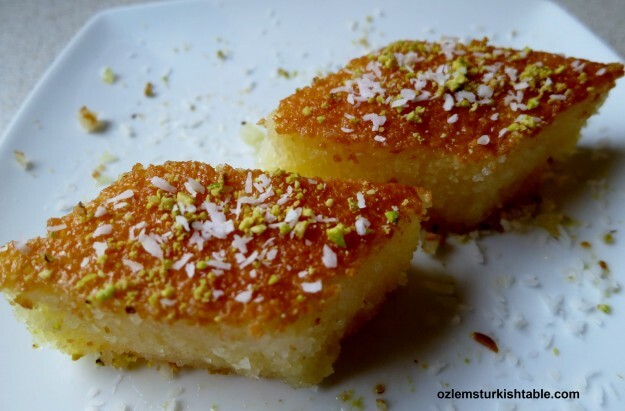 In Turkey, we like to decorate Revani with ground pistachio and desiccated coconut. I hope you can give this delicious, moist revani a try, it makes any day special. First make the syrup, as it needs to cool down. Combine the sugar and water in a medium saucepan (at a medium heat). Stir and bring the mixture to a boil. Once it boils, reduce the heat to low and let the syrup simmer for about 10 minutes, uncovered. Add the lemon juice, mix well and simmer for another 3 minutes. Turn the heat off and let the syrup cool down while you make the semolina cake. 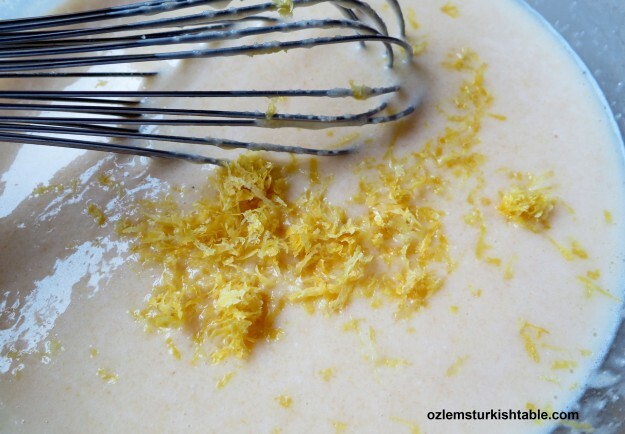 Stir in the vanilla extract, lemon juice and lemon zest and mix well until you have a smooth batter. Grease a square or rectangular baking dish (mine was 20 cm x 27 cm – about 8”x 10”) with 2 tbsp. olive oil. First beat the eggs and the sugar in a large mixing bowl briskly for a few minutes, until the sugar dissolves. Then add the remaining 2 tbsp. olive oil, yoghurt, semolina, flour, the baking powder and beat well. Stir in the vanilla extract, lemon juice and lemon zest and mix well until you have a smooth batter. Pour the batter into the greased baking dish and bake in the preheated oven for about 25 – 30 minutes, until the cake is golden brown. To check; insert a toothpick to the center of the cake, if it comes out clean, that means the cake is cooked. If not, bake for another 3-5 minutes. Using a large spoon, drizzle the cooled syrup all over the semolina cake. Let the cake absorb the syrup and cool down. 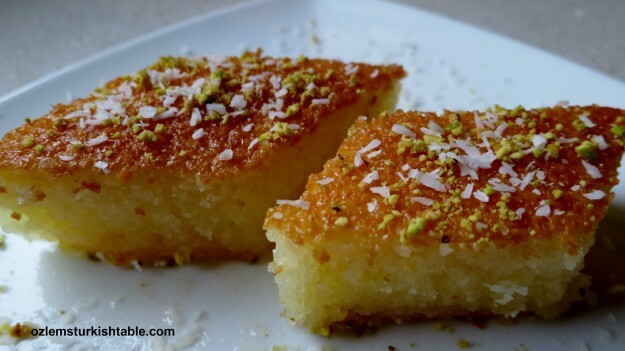 Once cool, cut the revani in square or diamond shapes; you can serve revani with ground pistachio and desiccated coconut over the top like we do in Turkey. Revani; semolina sponge cake in syrup, delicious. Revani gets even better the next day and keeps well, covered, for a good few days. 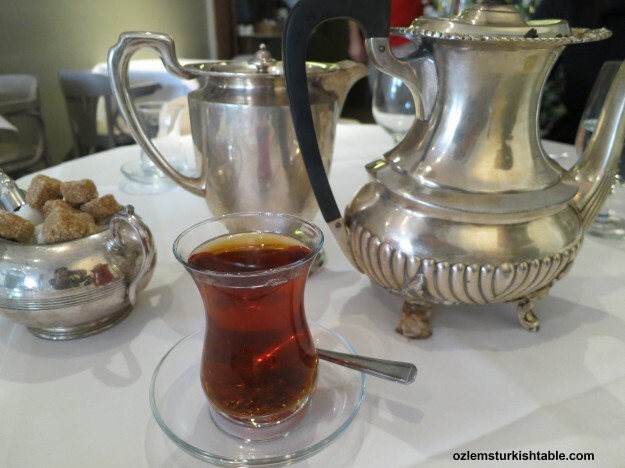 In Turkey, we enjoy revani with Turkish coffee or Cay, Turkish tea by the side. I’ve seen many versions of this cake and I’ve often thought I’d like to try making it. Somehow, I’ve never got around to it, partly because I wasn’t sure which version to try. But I’ve no real excuse now – this does sound delicious. Congratulations on the TV appearance. Thank you Phil, this is a little lighter than normal, but we do enjoy it – thanks for giving it a go! How exciting that you are going to be among the Turkish chefs of the world! Can’t wait to catch it on TRT. 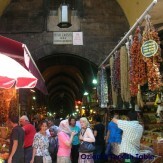 Merhaba Jolee, thank you so much for your kind note; I was delighted to have a little part at the program – I’d say more of a Turkish food enthusiast, who’s very happy to share & spread the word on Turkish cuisine abroad : ) Your trip to Gaziantep sounds heavenly, a serious foodie destination 🙂 hope you enjoy the revani! 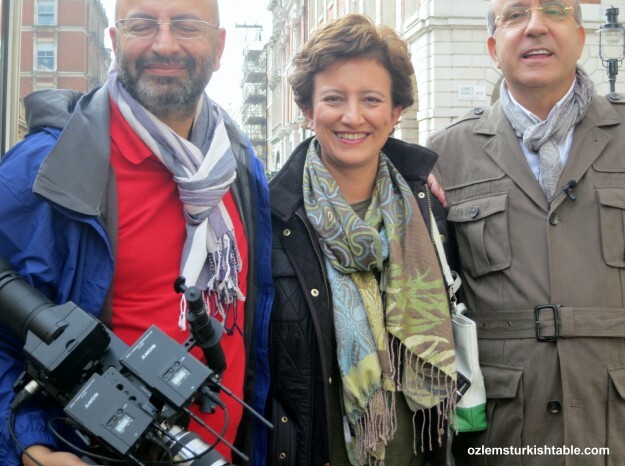 Ozlem, thank you for sharing this. I LOVE revani / basbousa in all its forms, and have never tried an olive oil version! I took a Turkish cooking class at Central Market San Antonio inspired by your recipes, and I wish I had been able to attend your Austin appearance recently. I hope to take one of your cooking classes one day soon! It certainly is a lighter and delicious looking version. Such a simple recipe. So thrilled on the Turkish TV interview, waiting to see it! Give me a heads up when it appears…xxPeri. This looks like a great recipe – I usually find renai too heavu so I’ll give this one a go. Pls let us know when you are going to be “on air”. I have just tried this recipe, it is extremely delicious. It was quite thin batter I thought it would not cook but it tuned out so yummy. Wonder can we add desiccated coconut in the batter? Will try next time. Thank you for the recipe. I am hoping to publish my manti recipe soon; don’t have the sam tatlisi here yet, will keep you posted once I get around to it. I made the Revani yesterday and it was a hit with everyone. I followed the recipe to the T but even when it was fully done, it was not brown on top. So i stuck it under the broiler for a couple of minutes and it browned. Merhaba Mayine, many thanks for your note – you are right, 2 tbsp goes into greasing the pan and the remaining 2 tbsp goes into the recipe; thanks for letting me know, I made this clear in the recipe – hope you enjoy Revani! I have been looking through your recipes and found that almost every recepi reminds me of my mom. I am an armenian and I know lots of what my mom made came from Turkish kitchen, even the names were Turkish. 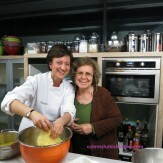 I am thrilled that I found your site, I love how you input your experiences or a story with each recepi. Thank you so much, I am making this and your lamb over the eggplants for my guests on New Year’s Eve. 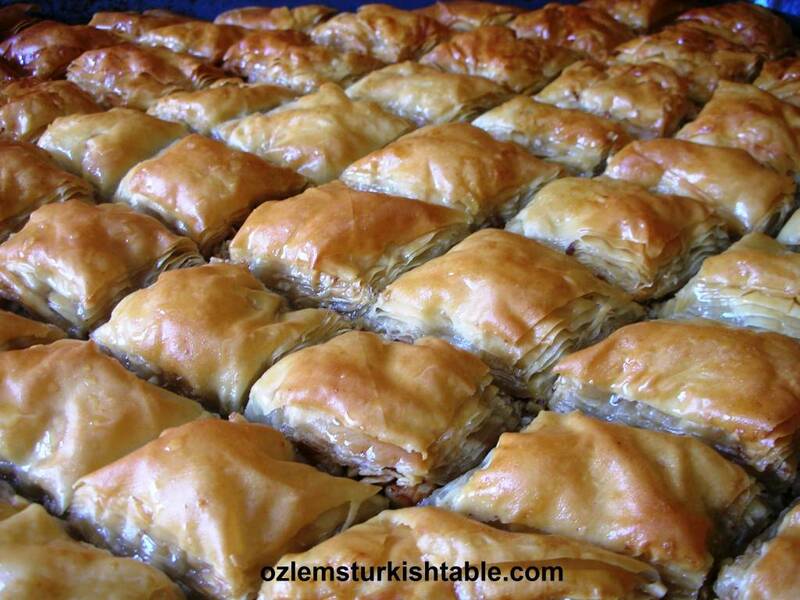 I love revani and have had a delicious version at our favorite Turkish restaurant many times. The photos with your recipe looked exactly like what we order but, sadly, when I made your version it came out very thick and dense, not light at all, and with none of the fluffiness the semolina flour should provide. The batter was very very wet. I know it’s hard to provide any advice on what I may have done wrong, but any thoughts you have would be welcome. Most other recipes I have looked at online are more or less the same as yours, so I can’t figure out what I am not understanding. Many thanks!! Merhaba Ken, many thanks for your note; sorry to hear about your revani; first thing comes to my mind is that, my version is made with the grainy semolina, not the semolina flour – if you used semolina flour instead, I would imagine the texture would be very different, with a variation of the taste. can you the grain semolina? I highly recommend trying with that – I hope this helps, many thanks again. Thanks very much for this; I did not know there was a difference between grainy semolina and semolina flour. I will see what is available here (Canada) and if I can get the grain semolina I will gladly try the recipe again and let you know how it works. 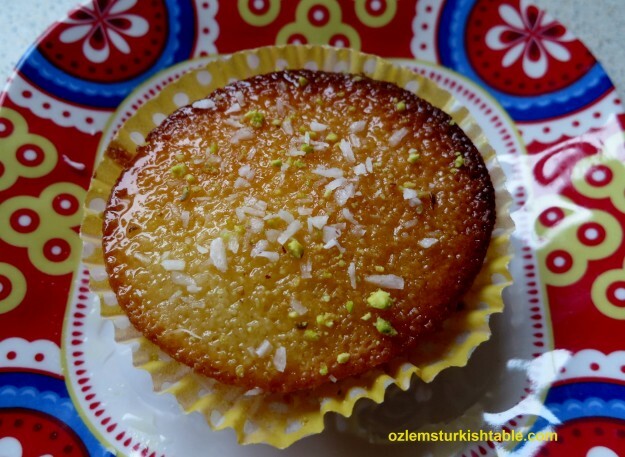 Hello again Ozlem…following our thread from early in January, I have finally been able to find some coarser semolina, though I am still not sure it is the correct product, i.e. I may just have a coarser semolina flour (it is still quite white, and not yellow as in your photos), and not actual grain semolina. I will make the cake again, but in reviewing the dry/liquid proportions in the recipe it appears to me the batter will be extremely runny, much more so than I would expect from a typical cake recipe. Do you have an opinion as to whether grain semolina would absorb more liquid than semolina flour? Many thanks once again! thanks Ozlem… so simple and will try this one soon.. I have tried this recipe and it turned out excellent! I just wanted to ask that if I use orange juice instead of lemon juice so how much should I use… Half orange or less than that? Teşekkür ederim for the recipe!! Merhaba Farheen, many thanks for your kind note, delighted to hear you enjoyed this Revani recipe! I haven’t made it with juice of orange, but thinking it’s bigger than lemon, juice of a quarter may work better. I would still zest of 1/2 orange or you can make this one a quarter too. Hope it turns out well again, afiyet olsun! Assalamoaliekum , Thankyou for sharing your recipe , my daughter tried it but we have two things to ask , 1: cake did not turn out as golden as in the pic , secondly it was a bit tart . since we did not have a regular yogurt we used low fat , is that the reason ??? Such a delicious moist well flavored cake. thank you for a flop proof recipe. Hi there, I was wondering if you put holes in the cake before adding the syrup? I’m so nervous, my husband is turkish and I am not a good cook, I feel sorry for him sometimes. I’m trying to start with a few simple turkish foods hopefully I can do this. I’ve made the cake today to celebrate bayram. I’ve just drizzled the syrup but I’m wondering if I’m to add all the syrup? Merhaba Josie, so glad you made Revani; yes please, drizzle the whole syrup and the semolina cake will absorb it all. Mutlu Bayramlar, hope you enjoy it! Thank you for this great and super easy recipe- everyone loved it. It’s bound to become a family favourite. I made a few changes- mostly because I don’t like using white sugar- & it worked really well. I used a cup of coconut sugar in the cake & made the syrup with just a cup of maple syrup & the juice of the lemon. The crushed pecans on top gave it a yummy crunch. Really delicious! Merhaba, delighted to get your note and your wonderful twist on the Revani, also loved the crushed pecans on top – so glad you enjoyed it, Afiyet Olsun! Merhaba Ozlem, sounds like a delicious recipe. Quick question, can you make Revani without egg or should I add something as substitute, because my son is allergic to eggs? Thanks so much. 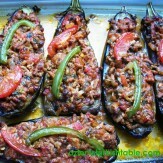 Merhaba dear Filiz, many thanks for stopping by, really is a delicious recipe, light and great flavor. Egg is a binding agent here and I haven’t made a version without egg; however I consulted my mother and she reckons 2 tbsp. or so cornstarch could help to bring it together, worth a try, hope you enjoy it. This is a wonderful recipe. I baked it last night and had a little this morning, wow. It is quite good. The moisture of the revani is unbelievable and the coconut adds a very nice flavor. You can really taste all the ingredients you used in the cake, and I absolutely love it! I plan in making this for my family. 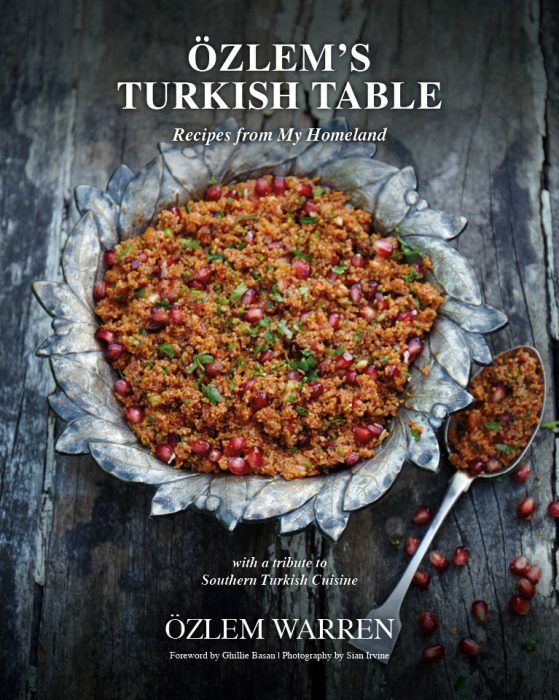 Receipe looks amazing and this will be my first attempt on turkish delights. Few queries regarding receipe …kindly help? How much beating of egg and butter…till foaming? Do u beat or just mix remaining ingredients like samolina…approx time if any? Merhaba, many thanks for stopping by and your kind note, do enjoy this favorite recipe of mine, Revani. As for your questions, you need to beat egg and sugar – not butter – for a few minutes as the recipe suggests. You then mix the rest of the ingredients, no need to beat. Cold syrup is poured on the hot cake while still in pan, then you let the cake to absorb the syrup. Once cooled and all the syrup absorbed, you can then cut the cake and serve – I would give at least 30 mins, ideally 1 hour. Afiyet Olsun! Bu revani o kadar guzel ki anlatamam. Gercekten mukemmel. Tepsiyle beraber yerim yemin ediyorum. Here I am, a South African in Selimiye, Turkey. I had th luck to find your revani recipie and I read all your kind and helpful answers to the people who made it. You sound like everyone’s friend.